With its cubic cobble stones and plane trees standing guard along the way, ancient Hungarian craftsman’s workshops and fading neon shop signs, Bartók Béla út, in the eleventh district of Buda, was one of the few streets near the centre of town that looked typically Hungarian. The cobbles have gone now, but Bartók, like Mester utca in the ninth district has that unique Magyar street ambience. Others with their flashy palaces of denim and burger bars could be confused with streets running through other great cities of Europe. The cobblestones are called macskakővek in Hungarian, meaning 'cat stones'. However, this all changed in 2003. In November, work began to remove the cobbles over which rattled the second largest stream of downtown-headed traffic. Every day 600,000 people jiggled along the painful route. The builders moved in and replaced the ancient electricity, gas, water and sewage systems. After an agreement on the fourth metro line, the station diaphragm walls were sunk at Gellért tér, Móricz Zsigmond körtér, Kosztolányi Dezsô tér and Tétény út. Tram tracks and sidewalks were replaced and the green areas were given new park benches, flower pots and bollards. Although the street looks a bit smarter, and the trams run more smoothly, the atmosphere has changed little. Bartók Béla út, the street named after Hungary’s greatest composer doesn¹t actually contain much in the way of musical heritage. At Móricz Zsigmond körtér there is a piano repair workshop and at the Budai Parkszínpad beside the Bottomless Lake (Feneketlen tó) at Kosztolányi Dezsô tér there are concerts by widely varying popular artists from Roma rap Fekete Vonat to guitar troubadour Péter Gerendás. A statue of Bartók (1881-1945) by József Somogyi stands beside the lake, under a frame of bells. Bartók Béla út begins at Gellért tér, graced by the beautiful Art Nouveau Gellért spa hotel and curves around the base of Gellért Hill to Móricz Zsigmond körtér. The fading Szabó photographer’s studio, second hand fur coat store and faded Cipôbolt share the wide, cracked pavements with more modern mobile phone outlets and optical showrooms. The tiny, cramped book antikvarium (antique shop) front is almost hidden at 10am every day by the lines of pensioners who rob their own book-shelves to sell another selection of first editions for groceries. On the right-hand side, some of the imposing buildings are worth a closer look, for the amazing stucco facades in pastel blues and greens and the hidden courtyards behind. At No. 23 there is a fabulously grand yellow courtyard with Classical pillars, while No. 33 is a walk-in shopping area with a grotto and steps leading up to a leafy glade. 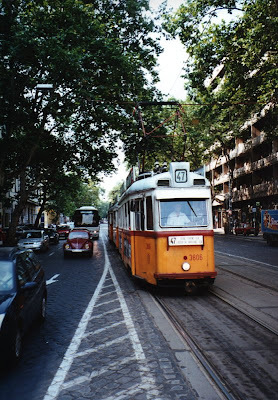 At the Bertalan Lajos utca tram stop, many homeless gather and sip wine take-outs from the countless borozós (wine bars, more proletarian than posh) on the street. They sit under the statue to Géza Gardonyi who wrote Egri Csillagok (Under a Crescent Moon) and the building behind (No. 36-38) resembles a giant cinema Wurlitzer organ rising up in orange stone out of the street. The doorway is guarded by two winged sphinxes with Cleopatra hairstyles. A little further along at No. 40 is an interesting building designed in 1899 by Ödön Lechner, the father of Hungarian Art Nouveau, to accommodate his brother Gyula, a writer and painter. The unusual decoration on the beige building resembles the stitching on the side of a blanket. When Bartók died in New York in 1945, he left a condition in his will that no place in Budapest could be named after him, so long as there were still places like Hitler tér (now Kodály körönd) and Mussolini tér (now Oktogon). Thus, immediately after the Second World War, the city decided to rename Horthy Miklós út after him along with eight other Bartók Béla út and utca dotted about Budapest. Móricz Zsigmond körtér (circus) named, like the following Kosztolányi Dezsô tér, after one of Hungary’s great writers, is one of the busiest, most atmospheric squares in Buda, rivalling Mozskva tér for life and colour, noise, birds, flowers, trams, homeless, drunks and dog faeces. A plaque to Móricz Zsigmond (1879-1942) reads “A Hungarian realist. The first to depict the realities of life of the Hungarian peasants”. A neon sign high on the rooftops advertises the services of the Manfréd Weiss factory on Csepel Island and looks down on the simpler stylistic designs of a Mcburger bar’s golden arches. The circus is a rickety wood circle around which trams rattle, the 18 and 47 on their way to Budafok, the 19 and 49 rumble all the way along Bartók Béla út to Kelenföld. In the middle, a statue to Prince Imre by Zsigmond Kisfaludy Strobl portrays King Saint Stephen’s son who died in a hunting accident aged 24. Interestingly, this statue managed to remain as a resting place for tired pigeons throughout the Communist period. 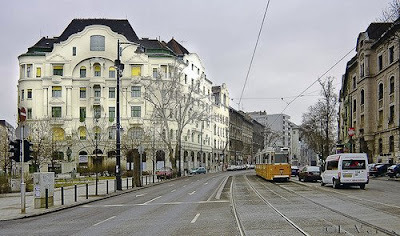 The circus was designed in the late 19th century to the grand American plan, with wide streets and huge squares, continuing in style at Kosztolányi Dezsô tér which is quite a terrifying road junction where broad radial roads meet. After Kosztolányi Dezsô tér, the road runs in an almost entirely straight line, cobbled all the way to Etele tér, in Kelenföld, the end of the line also for the famous No. 7 bus. At dusk, the Bottomless Lake is one of the most atmospheric parts of Buda. The Szent Imre church is illuminated at night and shadows are thrown across the reeds and water of the former quarry pit, which is actually only a few metres deep. At No. 62 a faded sign still bears witness to the one-time glories of the Bartók cinema. This was part of an apartment block designed by Gábor Preisich and Mihály Vadász in 1934. Preisich was a member of the Ciam group and was very influential in introducing modernism to Hungary. This building is one of his best creations. The street becomes more and more rural as it continues to Kelenföld, the ‘fields of Kelen’. Outside No. 98 a pile of steaming horse manure on the pavement helps the village atmosphere. Nearby is a horse tackle shop, a ‘Daisy’ gun shop, a knife shop and a garden equipment shop. At No. 125 the Nagyon Kis Vendéglô (Very Small Bistro) is a family-run bistro offering ‘cheap home cooking’ and just along the way is the Melódiás Haladás Eszpresszó (Melodic Progress). These types of establishments have died out in the centre of town but can still be found along the far reaches of Bartók Béla út, along with a wonderful workshop at No. 112 that will do everything from picture framing, to mirror cutting, zip repairs, bag lining and patches, as announced on a stylised brown sign. The Karinthy Theatre at No. 123-130 has one of those ancient cinema signs, where you can click the letters into the lines to show what’s playing this week. A little further along the Szent Gellért church is a modern building, but look around the side to catch one of sculpture Imre Varga’s stunning works. Jesus cradles Gellért in big silver wings with embossed metal decoration and carries him up to heaven. In Brussels, a statue of Béla Bartók by Imre Varga stands in a forgotten square between the Grand’Place and the Centraal Station. A group of Japanese tourists take photos and ask their guide who the statue depicts. “Bartók, a German composer I think,” says the young guide. At No. 133 a huge tram depot stands with a yawning gate. A group of static No. 19 trams gaze out from their shed. As we approach Etele tér, we are now in the heart of Kelenföld. It is somehow reminiscent of Szeged with wide tree-lined cobblestone streets and a sleepy Sunday afternoon ambiance. Kelenföld was the centre of horseracing in the 16th century, introduced by the young King Lajos II in 1525 and the area was still fields and vineyards up until only 100 years ago. The area received the name Kelenföld in 1847. Prior to that it was called Tabán. The area became populated in the middle of the 18th century when grape workers moved in. The origins of the name are argued about. Some attribute it to ‘Krenfeld’ which is ‘Horseradish field’ in German and all the agricultural workers there at the time would bear this out. Other say that there was a tribe leader called Kelen at the time of the occupation of the Carpathian Basin in 896 and they made their camps here and named it after him. We're visiting Budapest in October. What neighborhood should we stay in for the most history and mystery? I Love your writing. Hi Kim, that's a tricky one and it depends on what kind of hotel/pension you're looking for, too. 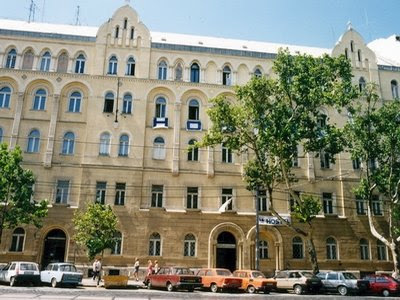 District V (Belvaros - the centre/downtown) has lots of luxury, five-star hotels, the best and swankiest being the Gresham Palace (Four Seasons). But for history, tradition and a fabulous spa, I would always recommend the Gellert (see my article). Situated just over the Liberty (Szabadsag) Bridge from the centre, it makes a great base for exploring the city. Also, you can go in the other direction and walk around District XI (Bartok Bela ut) and see more of the 'real Budapest' beyond all the touristy places. I also like MaMaison Andrassy Boutique Hotel, located on Andrassy ut (avenue) up towards the City Park (Varosliget). It's in District VI which means you can stroll along Andrassy ut towards the centre or towards the park and also head off into the little back streets of Pest. The MaMaison is home to Budapest's best restaurant, too; Baraka, so you'll never go hungry (ha ha). There's a lot to mention - you could also stay out in the Buda Hills, for example, but if you need more information or contact details, just let me know. You can also contact me by email (lucymallows.pix AT gmail DOT com) for more details. Glad you like the blog! Hope it's useful.